Tioga Pass is the high point (9,945 ft.) along Tioga Road. On one side of the pass is Yosemite National Park, and on the other side is the Inyo National Forest and Mono Lake. 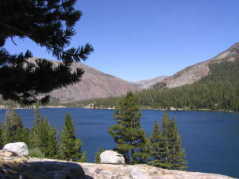 Tioga Lake is another Alpine lake nestled in among the pines and the granite.